Jeep JK & Caster: What is it? How do I measure it and how does it affect my Jeep? Caster is the tilting of the uppermost point of the steering axis either forward or backward (when viewed from the side of the vehicle). A backward tilt is positive (+) and a forward tilt is negative (-). Caster influences directional control of the steering but does not affect the tire wear and without adjustable control arms, is not adjustable on this vehicle. With too little positive caster, steering may be touchy at high speed and wheel return-to-center may be diminished when coming out of a turn. There are few things more terrifying than experiencing “death wobble” in your Jeep for the very first time. More times than not, it’ll happen out of the blue soon after hitting a bump in the road or a pot hole, driving over a rough set of rail road tracks or even after driving over rhythmic sections of expansion joints in a concrete laid highway. The sensation is unbelievably violent and so much so that it can feels as if your whole Jeep is about to tear itself apart. You literally feel as if you’re about to die and the only way to get it to stop is to bring your Jeep to a stop. Unfortunately, some people become so traumatized by death wobble that they become reluctant to drive their Jeep again and others go so far as to sell it. I can’t count how many times we’ve come off the trail and heard someone on the CB yell out that they’ve got death wobble. After pulling over and giving things a quick look to make sure nothing is broken, I have the driver help me perform this simple test. One of the most confusing and controversial subjects in the JK world is ‘Which locker should I use?’ So, rather than tell you which locker is best, I’ll give you the choices and a brief overview so you can decide what is best for your application and budget. The In’s and Out’s of Offset and Backspace – How do They Relate? Reducing the amount of pressure you have in your tires or, as Jeepers like to call it, “airing down”, is one of the easiest things you can do to improve the quality of your ride and significantly improve the amount of traction you’ll have on the trail. With your tires sitting at about 8-12 PSI, your tires will do a wonderfull job of smoothing out your ride as you make your way over small rocks and ruts and on bigger obstacles, the tread of your tires will be able to wrap itself around jagged rock faces and boulders. Of course, the more surface area the tread of your tires can make contact with, the more traction you will have. Needless to say, airing down your tires is so effective that it, along with disconnecting your front sway bar links, has become standard practice before hitting the trails. How much flex does my Jeep have and how do I find out? That was the question a lot of the people in the SoCal area were asking me and thanks to the generosity of Off Road Evolution for letting us use their RTI ramp, about two dozen members from JK-Forum.com got to find out last Sunday at our first ever JK Ramp Day Meet-n-Greet. Recently, I have been reading a lot of posts over on JK-Forum.com regarding steering stabilizers and I have to say that I find all the misinformation regarding them or the need for them to be quite troubling. With more and more people building up their Jeep JK Wranglers and getting them to sit on 37" tires or larger, it’s no wonder that so many members of JK-Forum.com have made axles and the components that make them what they are, one of the hottest topics of conversation. Whether it be in regards to installing new gears, upgrading axle shafts or replacing them altogether, people are looking for answers and in more cases than not, I have found that they don’t even know what questions to ask. Of course, a lot of this is because the subject of axles is completely Greek to them. 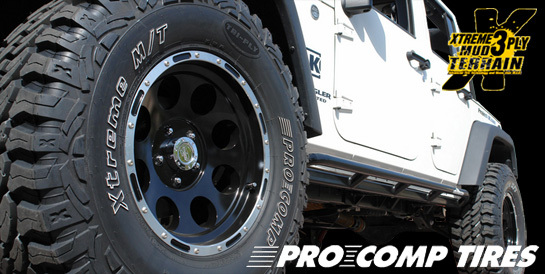 So, how have the Pro Comp Xtreme Mud Terrains been performing? Well, I can tell you that since I got them about a month ago, I have racked up about 3,000 miles on the odometer with a good 1,500 miles of that being put on driving out to Moab, Utah and wheeling the hell of the them there. And, I’d have to say that I’m pleasantly surprised as to how much I really like these tires!